Aomori Japan, the northernmost part of Honshu, is a lively prefecture full of culture, natural wonders, and a stunning countryside. Its capital is Aomori City, home to one of the biggest Nebuta Festivals across Japan, and is the biggest in Aomori, and more often than not you’ll find yourself indulging in some Japanese meals with a twist – they’re known for their intense production of apples, and apples will somehow wind themselves into your pies, juices, and even your typical Japanese curry! The region has a magnificent collection of natural wonders that just begs to be discovered, and whilst there are plenty of people already aware of how beautiful this region is, it surprisingly has not drawn the huge crowds that will hinder your visit. The visitors are more so domestic visitors who are still discovering the beauty of their own country, and it’s quite a wonderful thing to be there experiencing it with them. Aomori Japan – How to get there? Aomori is easily accessible, with transport methods like taking a Shinkansen and flying there the most popular, however, you can also catch a highway bus or even hire a car and do the drive (we highly recommend this, the countryside is beautiful!). 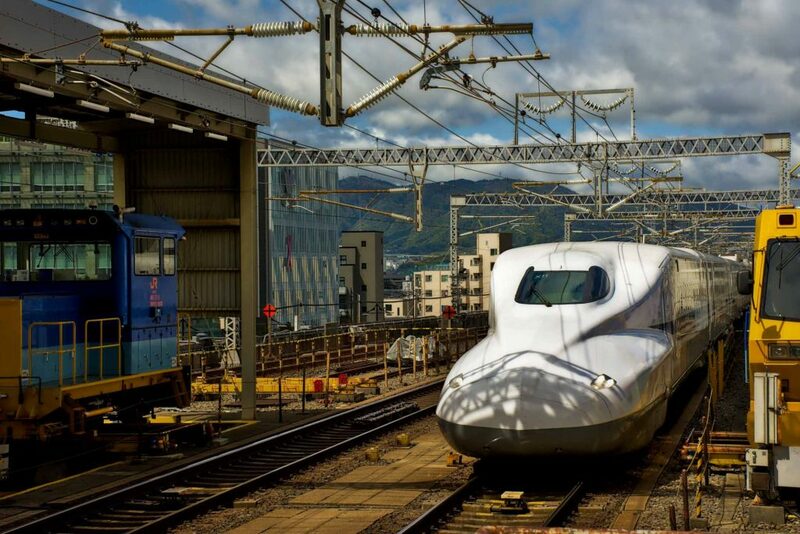 From Tokyo, you can take a Hayabusa train on the JR Tohoku Shinkansen to Shin-Aomori, and then transfer to a local train to get to Aomori Station. This entire trip should take less than four hours in total. It will cost around 20,000 yen for one person, one way, however if you have the JR Pass, it should be fully covered. You are required to book a seat on the Hayabusa trains, so please organize this prior at the JR ticket office in Tokyo. If you would like to catch a flight from Tokyo, a return flight with Japan Airlines can start from roughly 30,000 yen, which is relatively cheap, however, it can reach up to the high-end of 50,000 yen, so it’s definitely best to book as early as you can, or begin price alerts for sales when you’re sure of your dates. The flights are normally 80-minutes long. If you’re looking for a budget option, there are day and night buses that depart from Ueno, Shinkuju and Tokyo Station. 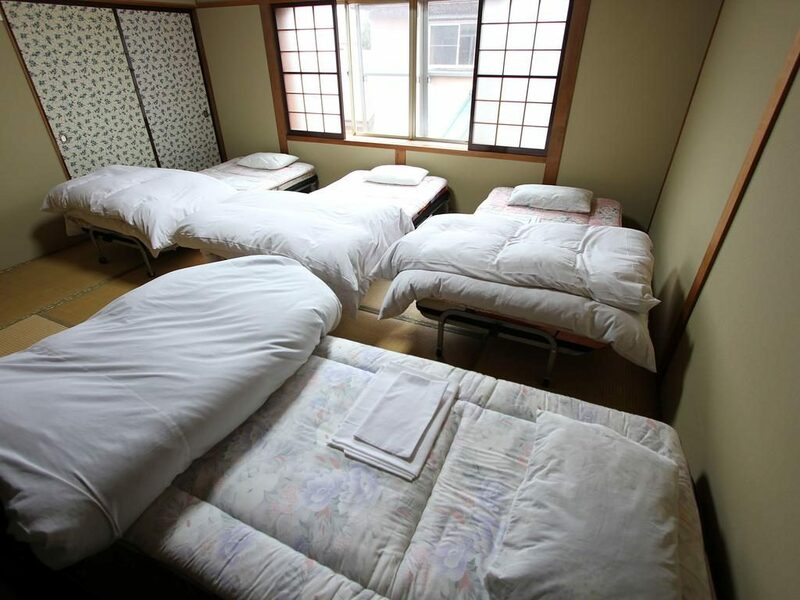 They can start as little as 4,000 yen for one person, one way, and go up to 9,500 yen. The journey, however, will take 11 hours, which is definitely something to consider. Two of the most popular bus operators include Willer Express and Japan Bus Online. Lastly, you also have the option of taking a highway bus to Sendai (located in Miyagi), for as little as 2,000, and then hiring a car to drive through Tohoku to Aomori. It might be the most cost-effective as well as convenient option for those without a JR Pass, as you won’t have to worry about relying on public transport otherwise. Aomori Japan – Where should you stay? Looking for a budget-friendly, genuinely comfortable home-away-from-home place in Aomori? 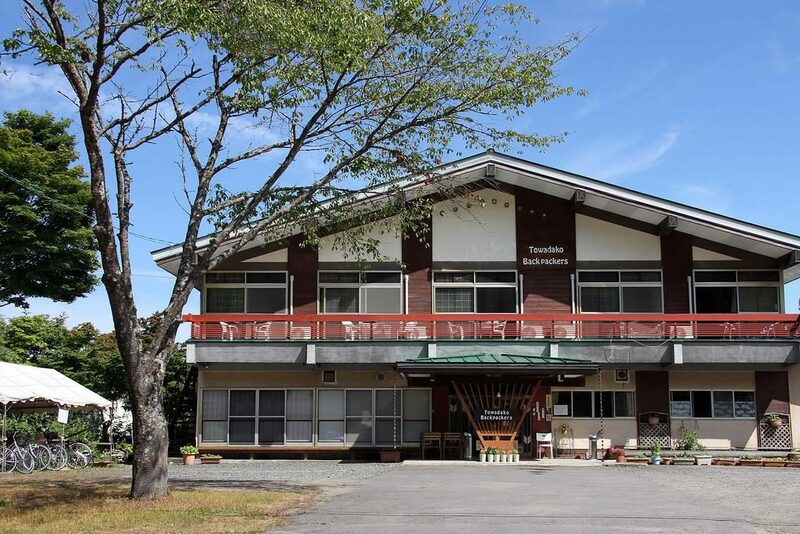 Look no further than this backpacker’s accommodation located right next to the stunning Lake Towada. For the price you pay, you’d be amazed at how close you are to the stunning views of the lake (literally a few minutes walk away). The place is generously sized, and gives a very homey vibe the moment you step through the wooden doors. The owners are very friendly and operate in a very casual manner. Beds = super comfy, amenities = clean and in great condition. You can also wake up to a simple and delicious breakfast of cereal and toast, with coffee, tea and juice. 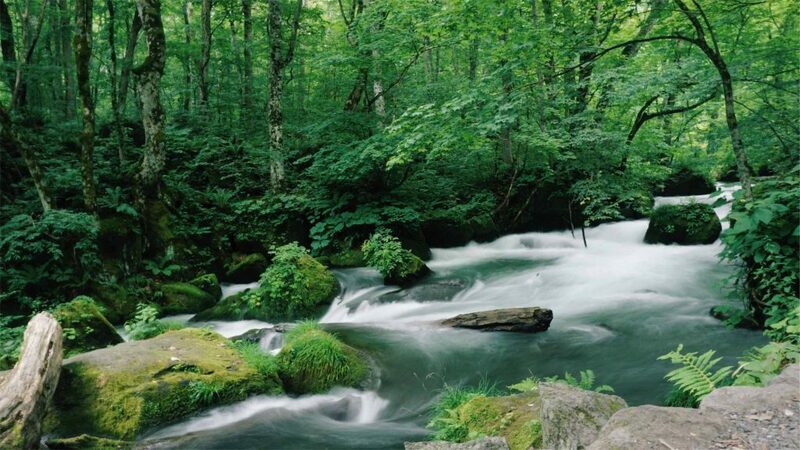 This place is a great place for those wanting to visit Mount Hakkoda, Oirase Stream, and Lake Towada. 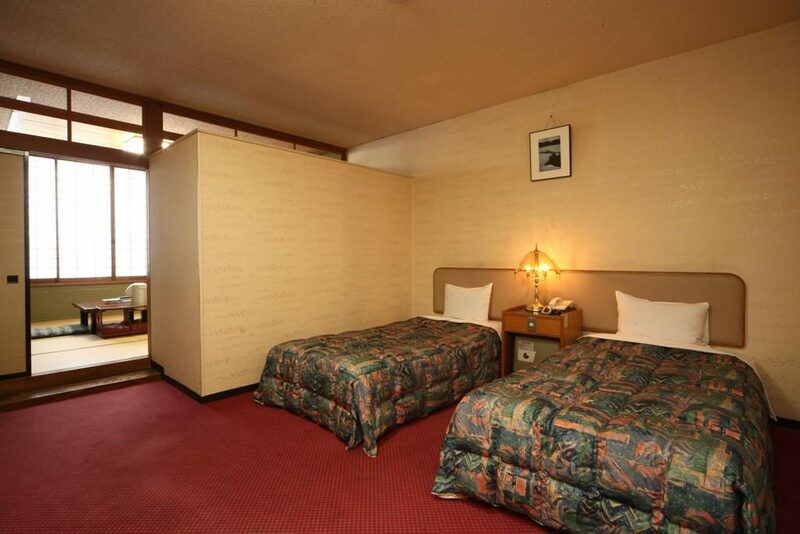 Located right on the shores of Lake Towada, this hotel offers all the amenities of a classic hotel with the serenity of a lakeside accommodation. An outdoor hot spring bath separates from it from the masses, making it the top choice for people visiting Lake Towada, especially in winter! This hotel offers Japanese-style and western-style rooms all with private bathrooms and Wi-Fi access across the entire accommodation. There’s even a souvenir shop located right at the hotel so you don’t have to venture very far to get those little thoughtful gifts for your friends and family back at home. 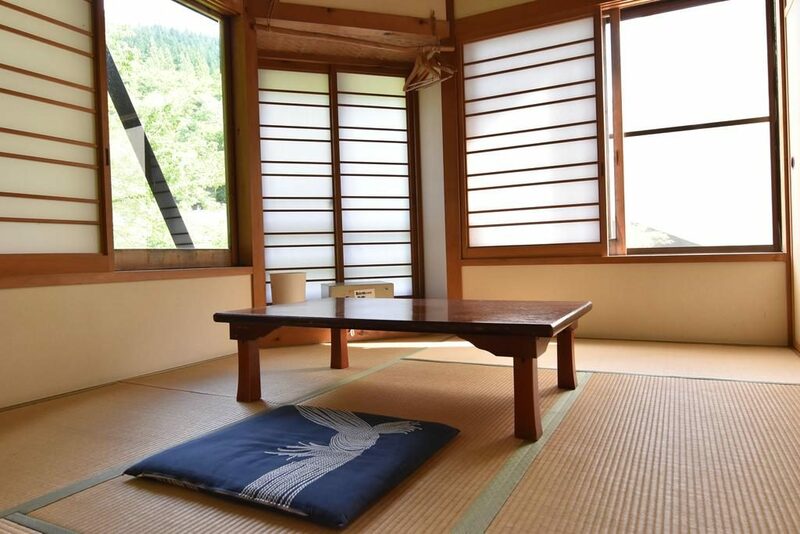 Feel like you’re a million miles away as you gaze out of the window whilst relaxing on the traditional tatami mat in the rooms, dressed in the provided yukata robes. Explore the surrounding areas of Oirase Valley, Towada Shrine, and the Statue of Maidens. Why Guests Love It: “Great location directly across from the lake, very spacious tatami mat room, fit for three, comfortable robes, many dining options within the complex, and the outdoor onsen is just wonderful. We also tried karaoke with the locals at the Bar Hich.”, “A piece of heaven hidden in the mountain far away from the crowd of the city. Quiet place and romantic. 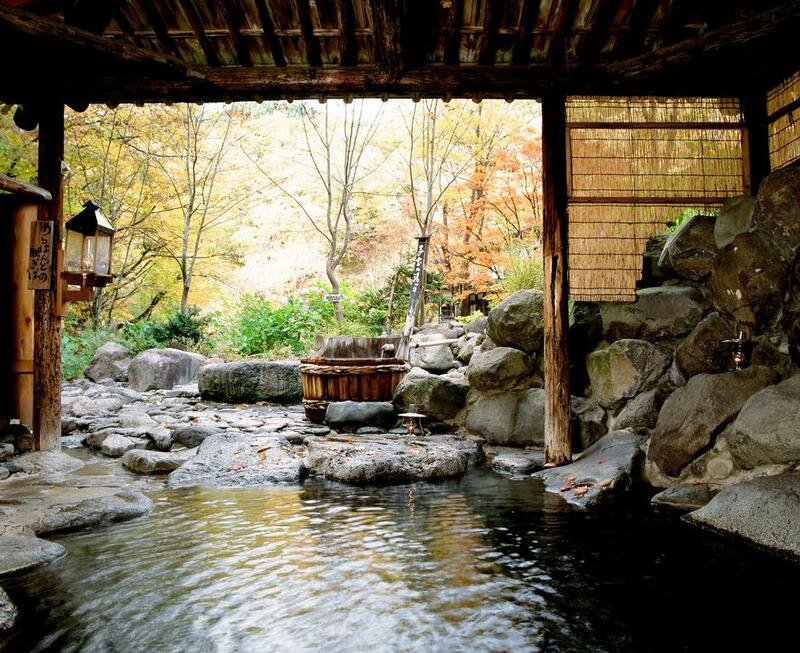 The Onsen is good and the food is fabulous”. Located right on the mountain, this place is truly a magical experience. There is no cellphone reception, and no electricity on the property, thus you’ll have to throw out the reliance on technology as you embrace the natural surroundings at this accommodation. At night, the property becomes lit up with lamp lights. Gorgeous mountain and river views welcome you as you enter your room which is decked out as a traditional ryokan room. 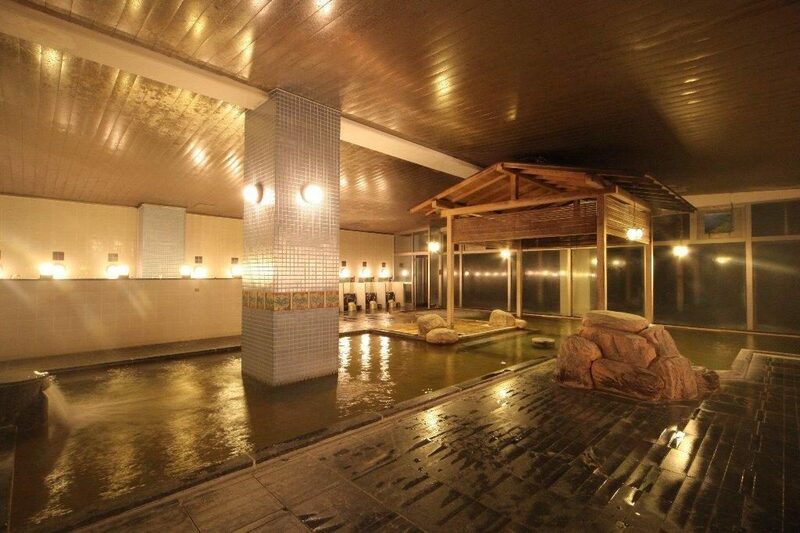 There are four different types of public baths located onsite, including an open-air bath and a hot springs bath. There’s even a free shuttle service provided by the property upon request if you need some assistance getting around, however if you’re driving, take advantage of the free private parking onsite. Traditional Japanese cuisine is provided both for dinner and breakfast. Why Guests Love It: “Perfect onsen/ryokan to get away from everyday hustle and enjoy a traditional stay.”, “It was a magical hideaway! Very romantic and traditional! The staff was very accommodating! Would recommend this place wholeheartedly!”, “Without internet and even electricity supply is a good and relaxing experience for a short stay.”, “If you want to be secluded in nature away from civilization without electricity, then this is the best place! Beautiful, peaceful, and good value for your money.”, “Shangri-La-like setting. Waterfall viewing from the onsen. Satisfying simple Japanese meals”. Aomori Japan – What should you eat? Tips on the local food! Aomori is surprisingly full of wonderful foods that either originated from the region, or else has been made popular by the incredibly fresh produce from the region. 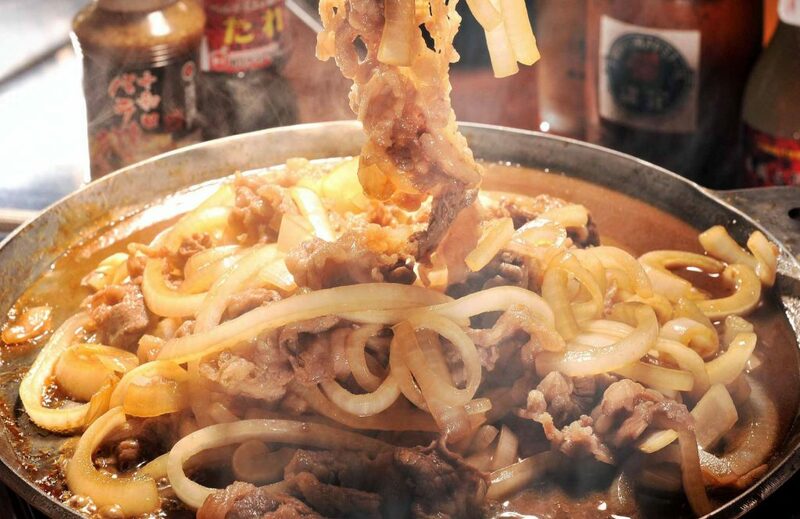 There are a multitude of dishes that can only be eaten in Aomori, or else are best eaten in the northern prefecture. Below we’ve listed the most popular dishes that you need to be on the lookout for! 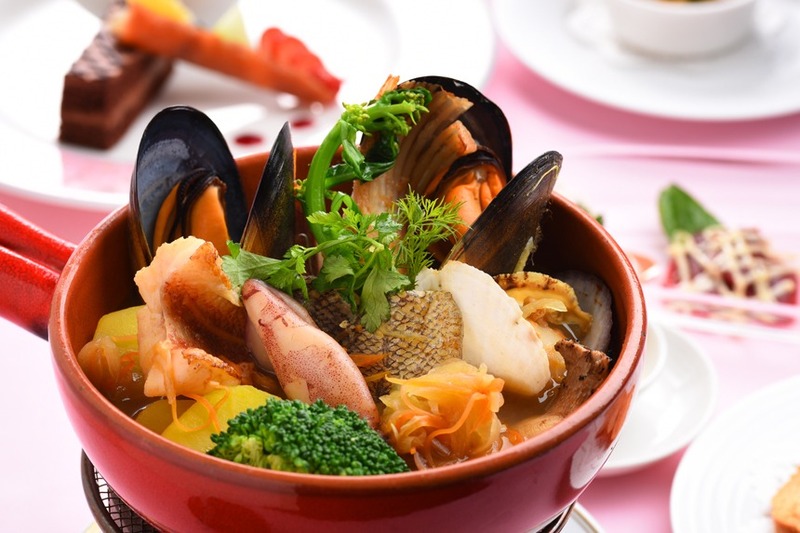 Hachinohe Bouillabaisse – this particular dish is a Japanese take on the classic French fish stew. 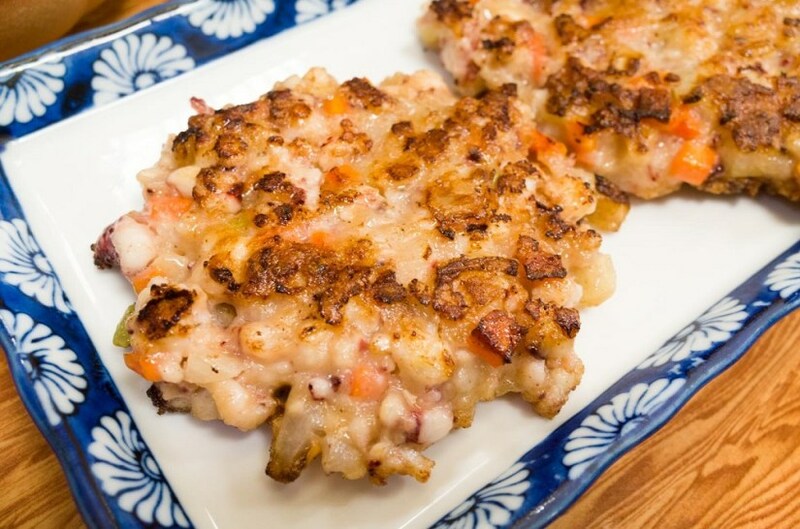 Hachinohe is a seaside city located along the eastern coast of Aomori, which makes sense that this would be one of its most popular dishes, as its seafood is as fresh as can be. From February until the end of March, people travel far and wide to this city to try this dish, which many restaurants offer as a seasonal dish. Expect to taste more than four types of dish in the stew. Igamenchi – a delicious snack dish of deep-fried chopped squid tentacles and fins mixed with some fresh vegetables. It’s normally eaten as a home dish, but you can order it at a few restaurants and most izakayas in Hirosaki City. 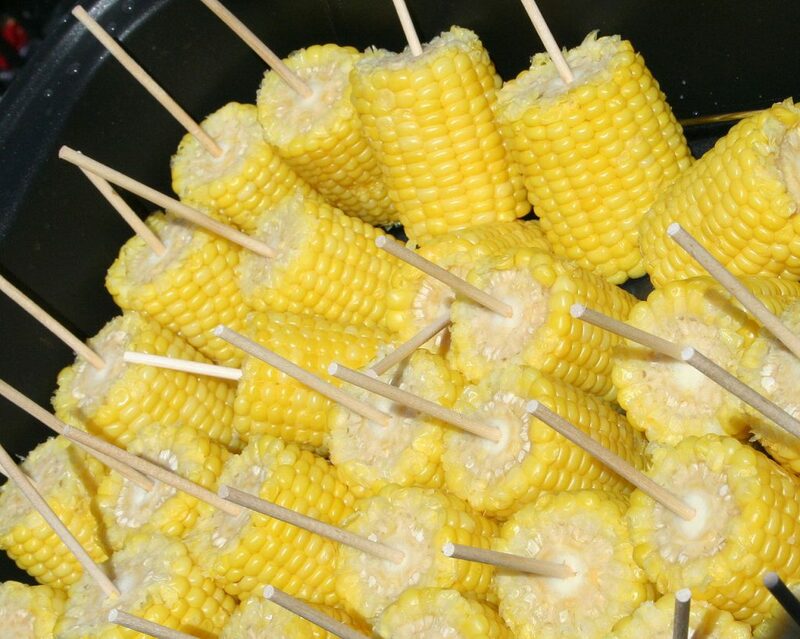 Corn on Cob – this is a strange addition, we know, as you’ve probably seen corn on cob all over Japan, but the Aomori people are particularly fond and proud of their corn, and you can see them on stands throughout the cities and particularly during matsuris. Why not give it a try! It’s bound to be sweeter than most you’ve eaten. 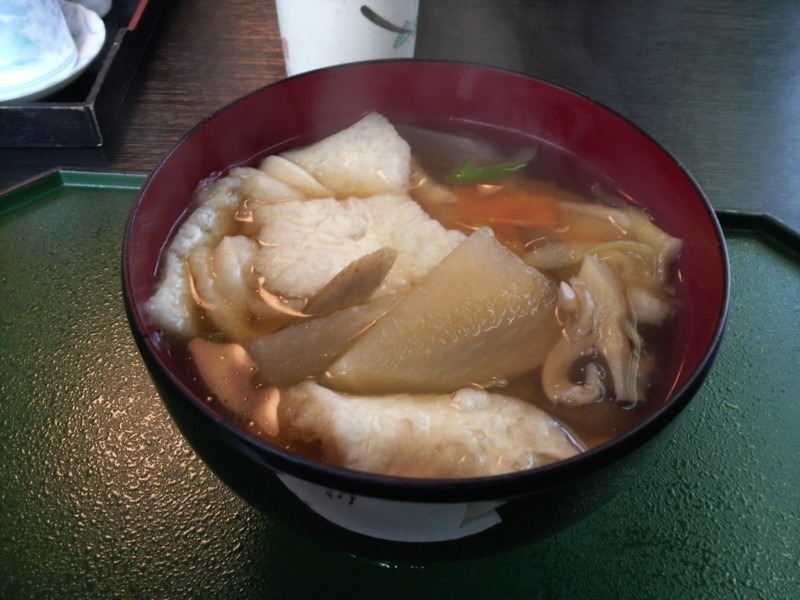 Hachinohe Senbei-Jiru – Another entrance that’s a specialty of Hachinohe, this dish is a stew containing various kinds of fresh vegetables, fish, meat, and in particular, mushroom and flour crackers. The crackers are special in that even when they’re soaked in soup and boiled, they don’t melt or disperse! Towada Barayaki – one of the most popular dishes with tourists, this dish is made with beef ribs and onions, and includes flavouring from grated ginger, soya sauce, sugar, and grated apple. 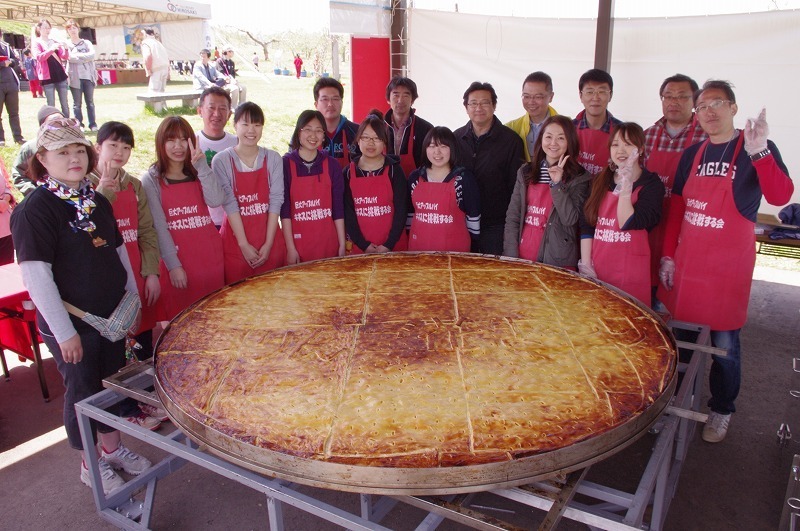 Apple Pie – it’s the ‘thing’ to do when in Aomori – eat apple pie. Their fresh apple produce adds a layer of flavouring that you just can’t find anywhere else. Do yourself a favour and find an apple pie in Aomori stat! Now let’s discover what to do in the beautiful area of Aomori! If you don’t want to go through the pain of organising your trip, you can also book a 2-day trip or a 3-day trip. The moment you lay your eyes on Oirase Stream you will fall in love. Stunning clear water flows gently through the stream amongst vegetation and trees that shine a brilliant green. 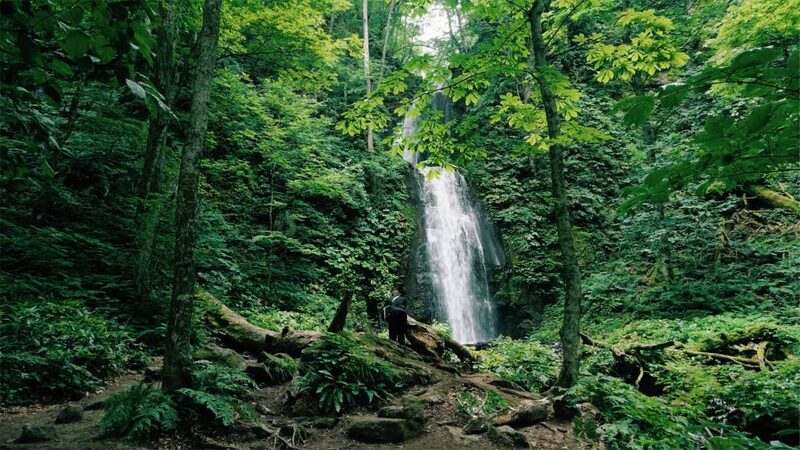 This place is the epitome of a stunning nature landscape, and even if you don’t want to hike the 9km from Nenokuchi to Ishigedo, stopping by any of the points of interest along the stream will bring you a sense of peace, wonder, and thankfulness that you’ve been able to experience such beauty. It is best explored during Autumn, when the gorgeous warm-toned foliage makes its appearance, however, during late spring and late summer, you will still feel incredibly taken away by the luscious green beauty of the place. There are buses that run along the route which stop multiple times so you won’t need to hike the entire way. Otherwise, park at the Ishidego Rest Stop to start your trip, and you can hike a little, head back to your car, drive up a little, stop on the side of the road, hike a little more, head back to your car…and so on until you’ve ended up at Lake Towada. How to get there: there are buses that run from Nenokuchi (towards Lake Towada) to Yakeyama which can be taken by anyone. You can hop on and off at any of the various stops along the stream and go exploring, and hop back onto another bus. Otherwise, there is free parking available at the Ishigedo Rest Area. Various cars stop along the route where there is space to stop, however, this is not advisable as it could lead to traffic congestions. Cyclists also make use of the roads quite a bit. If you plan to head to Oirase Stream to explore the route, make sure Kumoi no Taki is on your list. It’s one of the most popular waterfalls along the route, and for good reason! The moment you see it from the side of the road, you will be entranced. The stunning waterfall reaches up higher than most waterfalls along the route, and usually surrounded by foliage, luscious vegetation, and rocks that reach up into the cliffs atop. The water from the waterfall flows into a stream that reaches towards the entrance over rock and pebble formations that also deserve a notable mention. Heading there in autumn means you’ll be able to experience the famous ‘koyo’, but summer is equally as stunning. If you’re an avid hiking, or enjoy great outdoor scenery, do yourself a favour and make your way up the Hakkoda Ropeway to the top of Tamoyachidake, one of the peaks that make up Mount Hakkoda. Of course, this can only be done in Spring, Summer, and Autumn. For an easy hike, there is a hiking trail from the peak to a small marshland nearby that will take roughly 45-60-minutes as a round trip, which makes for a perfect exploration trip if you’re not into strenuous exercising, or have some young kids in tow. Otherwise, if you’re after an adventure, there are multiple other peaks which take upwards of 4-5 hours to complete that you can take to other peaks on Mount Hakkoda, down to the base of the mountain, and to a popular ryokan onsen located nearby. This is a great activity to complete in half a day, or else dedicate an entire day outdoorsr and sink into the nearby onsens afterwards. In Winter, Mount Hakkoda is one of, if not the, most popular ski resort in the entire Tohoku region. 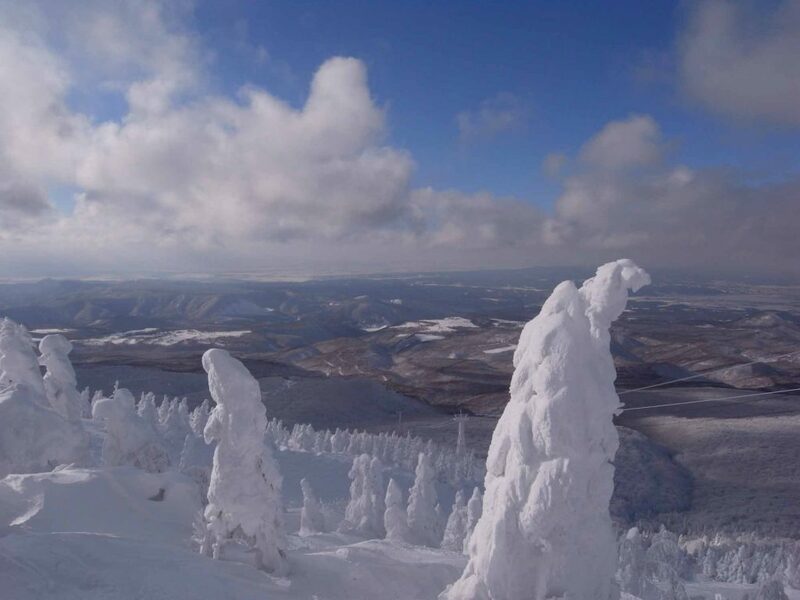 Due to the heavy, free-falling snow, Mount Hakkoda, along with Zao Ski Resort, are the only two snow regions which are capable of producing the famous ‘snow monsters’, which are one of the biggest reasons people visit. They are a stunning sight to behold. 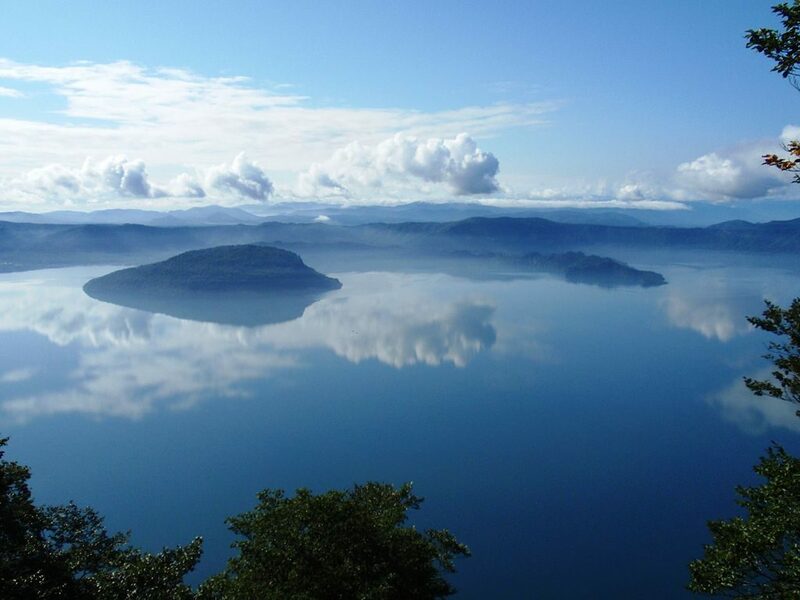 Lake Towada is the most famous lake in Aomori, and is one of the most visited places by tourists in the area. There are a multiple of activities to do there, depending on the season in which you visit. Throughout the year, there are various viewpoints around the lake which you can access observation decks and see stunning views across to the other side where backgrounds with mountains await. Stop by and take a picture with the famous “The Maiden” statue of two young Tohoku women. If you’re a cycling enthusiast, hire a bike and take the route around the lake, it is incredibly calming and exciting at the same time. In spring, summer, and autumn, you can hop onto a sightseeing boat that will take you through the lake, offering views you simply can’t capture on shore. You will be taken to see close-ups of peninsulas, and it is fully recommended that you go in autumn as the additional beauty of the ‘koyo’ will just add another layer of beauty to the scenery. In winter, there is the Winter Story Festival which is held annually in February, featuring a grand snow statue, an igloor bar, and beautiful illuminations – all this by the lake! 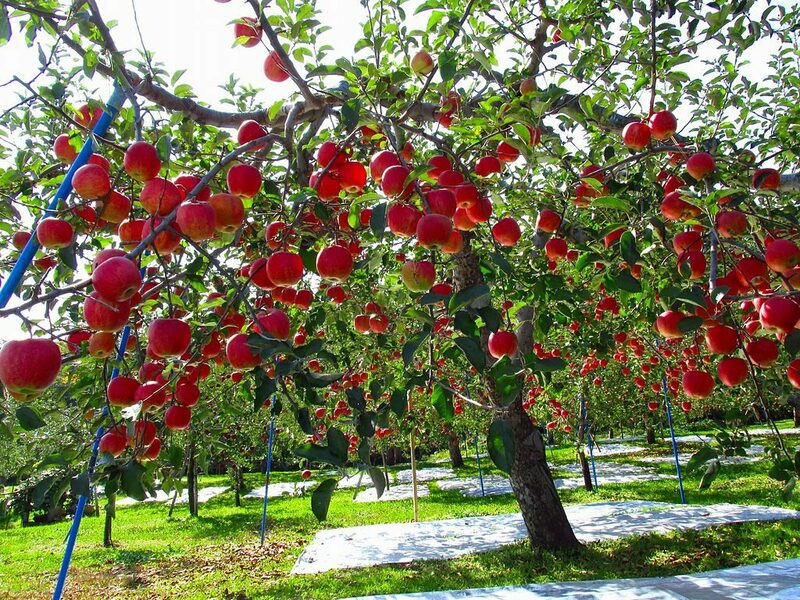 We’ve said it before, but we just want to reiterate just how wonderful everything tastes with apple in Aomori. If you come across any dishes that offer that special apple twist, give it a try! You will not regret it. 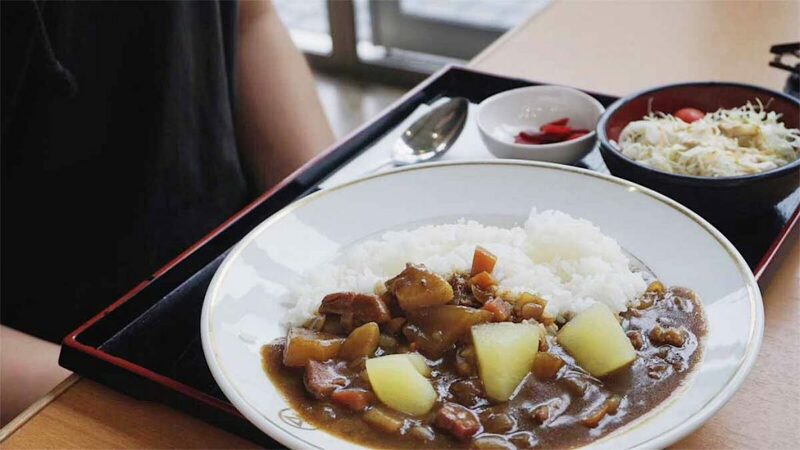 One of the highlights that the region offers is Japanese curry with apple flavouring. Now before you go imagining an savoury apple pie with curry flavor and beef pieces and start feeling a little quesy, hear us out – it’s actually quite delicious! Instead of massive potato chunks, there are pieces of apples instead, which, contrary to popular belief, goes quite well with the curry. The sauce is obviously apple-flavoured, but in a non-obstrusive way. The Oirase Garden Keiryu no Eki Oirase, located past the Ishigedo Parking Lot, serve up a mean Aomori Apple beef curry. Pop by here for lunch after hiking the stream and give it a shot! Imagine massive fields of grass, completely uninterrupted by any buildings, backgrounds of big blue skies, trees, and more fields of grass, with no other human or city in sight. If you venture into the grasslands of the Tashirotai Marshlands, that’s exactly what you get. Whilst you shouldn’t expect anything other than to capture a unique landscape in a quiet, peaceful setting, it’s still worth the time. The walk into the famous wooden walk boards area is not too far from the car park, and it’s probably one of the only places across Japan where you’re able to capture scenery like it. A visit in Autumn would be best, as the field turns a fiery orange-red colour. One of the biggest morning markets across Japan, this is like an awakening of all the senses. It is located right on the fishing port of Hachinohe City, and draws in thousands of visitors at a time. There are literally more than 400 stalls which set up before sunrise for operation at sunrise, and they will continue to do so until they’ve run out of produce or until around 9am, when most stalls would have closed up for the day. This market only operates every Sunday morning from April until November (closed from January until mid-March). The market is one of the liveliest ones you can ever visit. Locals and visitors stream in as massive crowds to sample the day’s foods and purchase fresh fruits and vegetables from stalls which stretch along the entire wharf. Don’t have breakfast before coming there, because you will be absolutely spoilt for choice. The fried chicken here is legendary, and from 5am until closing time, there will still be massive lines at the most popular ones. The drip coffee stands sell smooth, fresh cups for your indulgence. 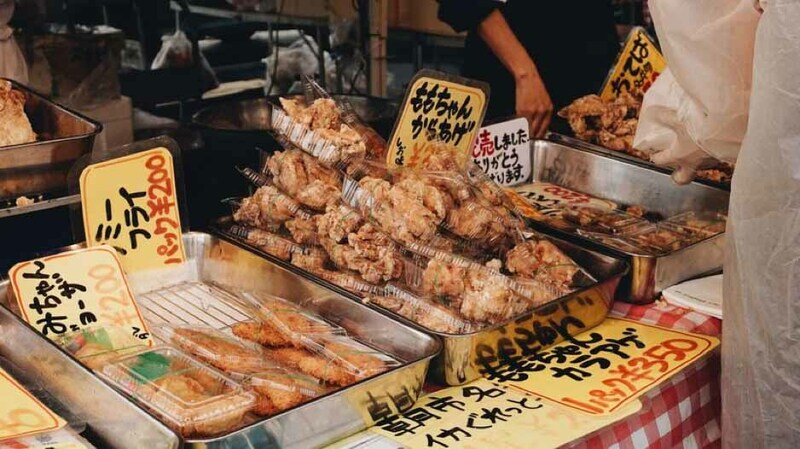 Various other foods stands will sell yakitori, grilled tofu, freshly baked pastries, doughnuts, sushi, grilled fish, and fresh seafood to just name a few. Many stands held by local farmers will lay out produce of an array of colours, from your much-loved cucumbers (a huge bag for 100 yen), to weird looking plants that just beg to be tried. Due to its location, expect it to be a bit windy as the winds of the ocean whip across the stalls, but that won’t deter anyone. Access: There are 500 parking spots within the market itself which is free, otherwise it is a 10-minute walk from the JR Mutsu Minato Station. 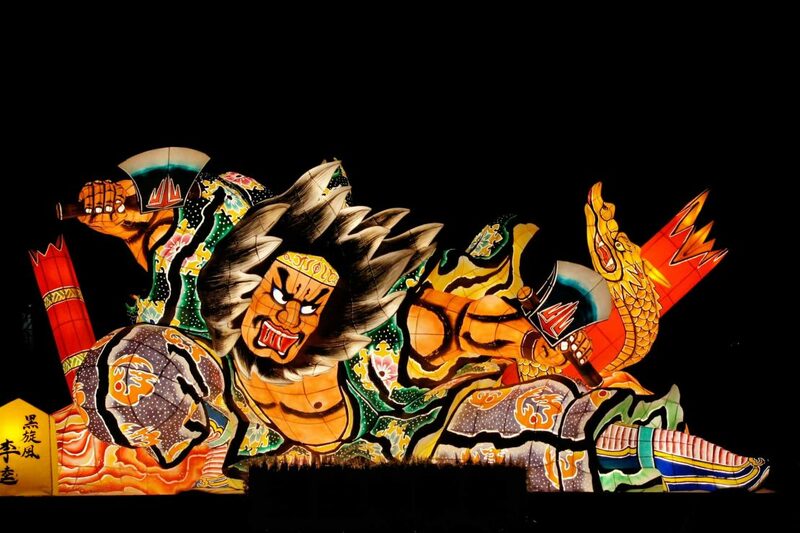 The Aomori Nebuta Festival is one of the biggest, craziest festivals you will ever get to experience. 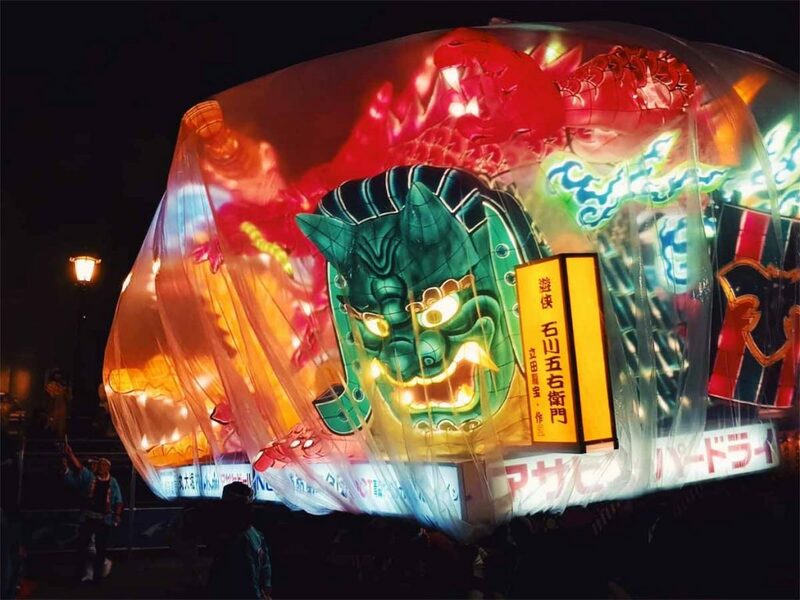 It is a Tanabata-type of summer festival that sees a daily parade of enormous (we mean enormous) lantern floats pushed and pulled by trained locals, flanked by large taiko drummers, musicians, and dancers. 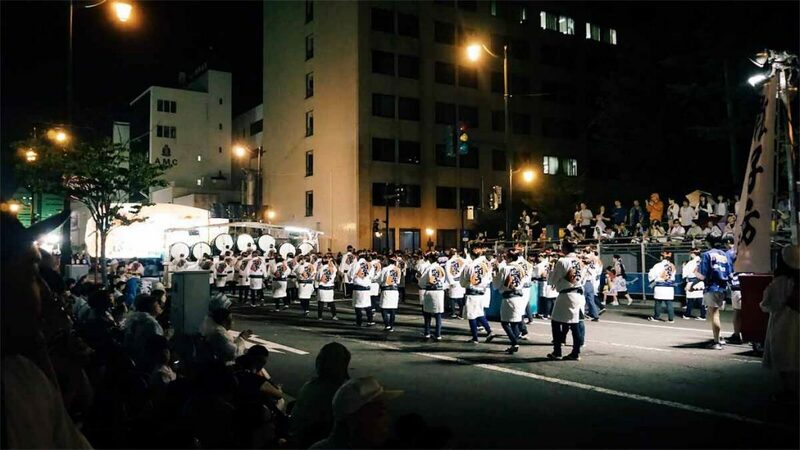 This festival, along with Akita’s Kanto Matsuri and Sendai’s Tanabata make up the Tohoku Sandai Matsuri (Three Great Festivals of the Tohoku Region). To fully appreciate the floats, you must know that the locals actually build all the two dozen floats which are paraded. They are constructed of painted washi paper over a wire frame and take almost an entire year to design and ultimate construct. A lot of time and effort go into them, and when you see them in real life, the detailing of them all make it worth it the wait. 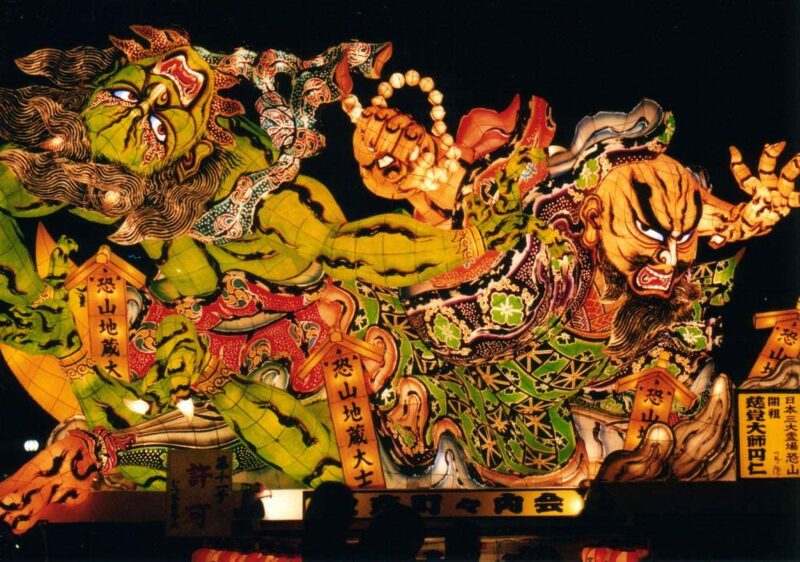 The floats depict gods, historical or mythical characters deep-rooted in culture, kabuki actors, and characters from popular historical drama series’. Sometimes there will be sponsored floats, and sometimes you may even see one of characters of global phenomenon like Pokemon. When the floats begin to parade through the streets, you can hear a pin-drop as the crowds along the sidelines fall into a hush, and the moment the first float appears, you’re bound to hear an uproar. The chant ‘Rassera, Rassera’ called by the hundreds of dancers, musicians, and float operators, as well as enthusiasts in the crowd, can be heard in the next town over. Dancers will devotedly perform a dance that is a mix between a hop and a skip over and over, and hype up the crowds with their loud chanting and efficacious vibes. The parade lasts for just under two hours, so be prepared to have slightly sore legs afterwards. If you get hungry, there are many food stalls operating around the sidelines for you grab some local delicacies, or just fried chicken if you’re not feeling too adventurous. One of the most unique things about this festival is that they encourage participation in the parade by just about anyone! The only requirement is that you need to wear the traditional haneto dancing costume, which can be bought at grocery stores or convenient stores around the prefecture/city for around 7,000 yen, or rented from shops around town for around 4,000 yen. The festival is held every year from August 2 until August 7. The first two nights of parades are somewhat more mild, however, from the 4th until 7th, the floats are out on full swing for two hours, with a waterfront firework display to finish off the incredible festival on the last night. The floats follow a route throughout the city. Check the website for the route and make sure you arrive early to snap up a good viewing spot! Access: Head to Aomori Station, and follow the crowds! It’s a rough 10-minute walk. Aomori Japan is hands-down one of the best regions in Japan. In winter, the snow-scape is on a league of its own, and during every other season, the activities list is simply unreachable by any other area. You’ll sometimes find yourself lost in moments of peace and serenity staring out at the vast horizon on top of a mountain, and other times you’ll be in the midst of a boisterous crowd singing and chanting along at the many matsuris held throughout the year. 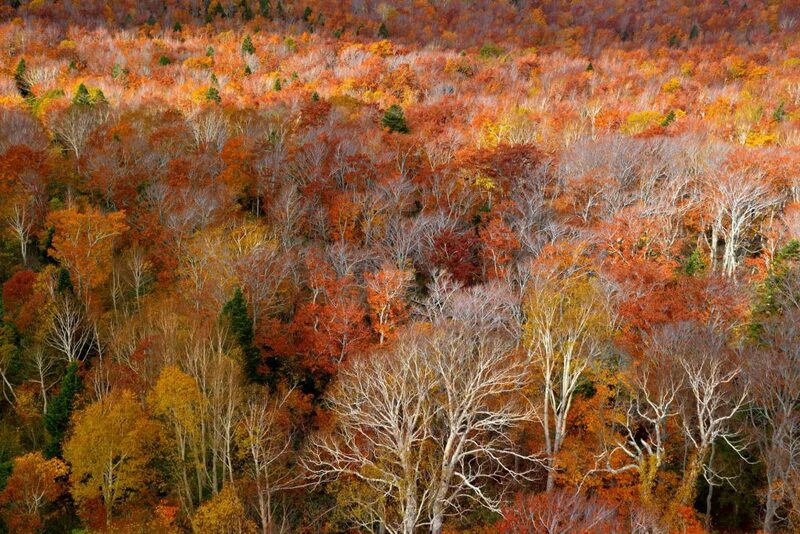 Whatever it may be, Aomori will definitely leave a lasting impression.